Aside from monitoring battery symmetry, it is possible to monitor each individual battery block with a Battery Analysis and Care System (BACS) module. BACS is the ideal system for all lead-acid based batteries (open/wet cells, maintenance-free, gel, AGM etc.). The BACS modules are connected to each battery to monitor individual block voltages and temperatures. The BACS modules ensure a uniform block voltage within the battery circuit, which considerably extends battery life expectancy. The patented BACS Battery Analysis & Care System provides a battery monitoring and management system that can be integrated into the network. It cyclically tests internal resistance, temperature and voltage of each battery, ensuring individual treatment for each unit. 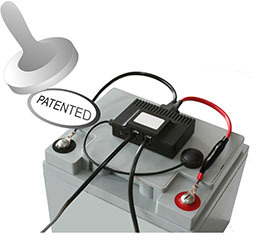 The patented EQUALIZING process corrects and controls each battery’s charging voltages. The batteries are kept in the optimal voltage-operation zone. The constant monitoring and control of each battery's individual charging voltage guarantees the availability of each battery at any given time.